Unlike acrylic paints, stains seep into the surface of wood so some preparation of your turning will be required to keep this to a minimum. The application of stain adds colour, without obscuring the natural beauty of the grain. Here I show you a few methods of effectively applying stains. The surface to be coloured needs to be extremely well finished, as scratches, torn fibres or tooling marks will become very visible with the application of stain. Step 6 shows an example of a poorly finished surface with stain applied. You can see that the stain is more pronounced in the scratches making them very visible. I purposely scratched the surface with 120 grit abrasive to highlight this. Open grain timbers, such as ash (Fraxinus excelsior), absorb the stain more than tight, close grain timbers. Step 5 shows how far a small amount of stain can spread along the surface, soaking into the open grain. For items such as bowls, where the rim is to receive a stain, it is advisable to turn the bowl and seal the inside ensuring all the end grain fibres are adequately sealed to reduce the penetration of stain. Wearing a pair of disposable gloves, apply the stain using a piece of kitchen towel or similar. 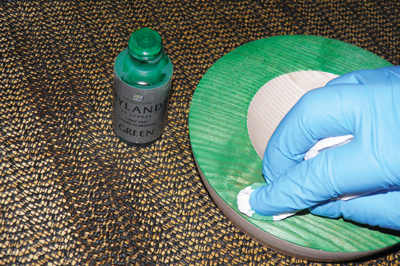 When the stain has dried fully, sand the centre of the bowl with a fine grit to reveal a clean, stain free end grain surface. 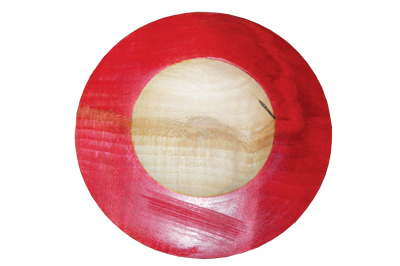 Apply your desired finish to complete the bowl. 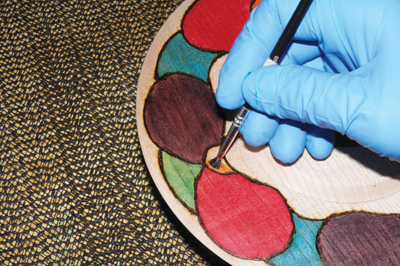 For multi colour application, a pyrography machine can be used to burn lines to separate the different colours. 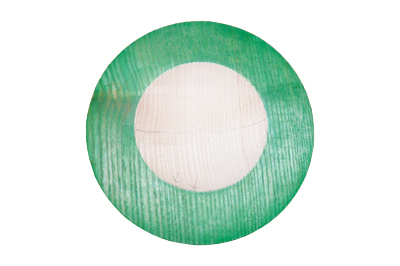 The surface of your turning will need to be sanded to a finish and left unsealed. 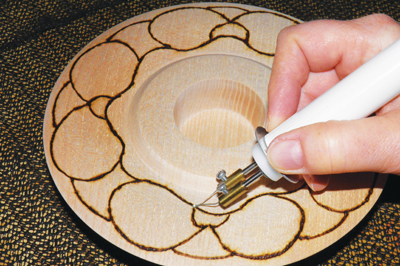 Using a scalpel tip, attached to your pyrography machine, burn your desired pattern and apply the stain. The burned lines absorb any stain seepage, allowing the colours to be freely applied without merging with each other and lessening the effect. I use small paint brushes which are dedicated to each colour; the bristles have been trimmed for ease of application. Alternatively, for a more natural appearance, these burned patterns can be left unstained if you so wish. 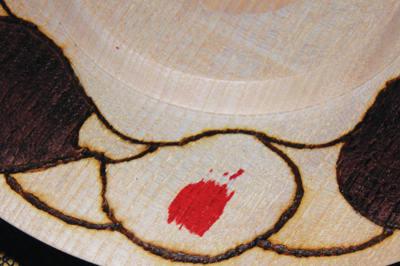 When using the pyrography machine there will be plumes of smoke generated from the burning of wood; it is advisable to be in a well ventilated area preferably with a fan positioned to blow the smoke away from you.